Some movies are good enough all on their own, the story is complete and the issues resolved; the proverbial bow has been tied. Other movies are made with the intention of becoming a franchise or series. The unwillingness of Hollywood to tell a difference in the two scenarios leads me to a real problem in Hollywood; needless sequels. Based off of the success of last years movie, The Purge, director James Demonaco and his group came back to make an obligatory, unnecessary sequel; The Purge: Anarchy. Last year, I got a taste of excitement with The Purge. It was something different, not amazingly good or anything but different. Before it came out, I looked for a graphic novel for it, a foreign version, an old TV show, anything that might fit the typical Hollywood process of finding ideas. When my efforts came up empty I went to the theatre full of hope that maybe DeMonaco and his group had found something that could break up the un-originality that plagues movie-making today. I left the screening pretty well satisfied, not awe-inspired or anything, but entertained. 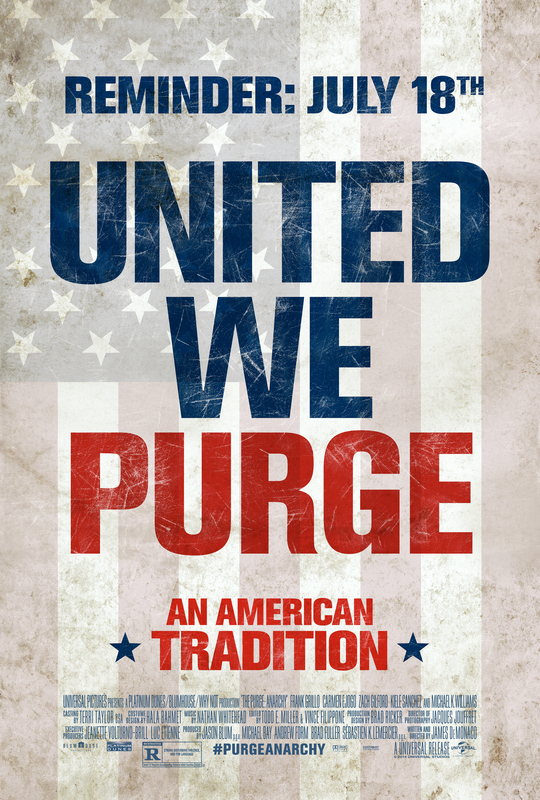 Enter the sequel… What part of The Purge made you think a sequel was needed? After watching The Purge: Anarchy I pulled out my DVD of The Purge to see if I missed anything in the story, nope. I also looked for any commonalties between the two movies outside of the setting, still nothing. Finally, I looked to see if any of the characters somehow slipped my attention and appeared in both movies without me noticing, strike three. It is official; The Purge: Anarchy is a money-grab only. The story is set in the same reality of the first movie. It is one year later from the events of The Purge and people in the downtown areas of the city are preparing. They are all preparing for the one night of the year when laws and morality are suspended and society is encouraged to “release the beast” and “purge for the greater good.” We are introduced to a mother and daughter in their apartment, a husband and wife driving through town, and a very disturbed man suiting up for war. Each is doing what they can to ready themselves for the 12 hours of carnage that are on the way. Once the horn blasts and the purge begins the three different perspectives all come together through circumstances outside their control and are forced to face the night as a team. The cast of actors in The Purge: Anarchy does not contain a “big name” to anchor the cast like Ethan Hawke did in the first movie. As a matter of fact, it does even have a “bigger” name supporting cast member like Lena Headley. Frank Grillo who played Agent Brock Rumlow in the most recent Captain America movie and Zach Gilford from the TV version of Friday Night Lights were the most well-known, or recognizable, members of the cast. The casting of a large number of, primarily, TV actors will make you think, “I have no idea who that is, but I have seen them somewhere else.” Even considering the cast’s overall lack of big screen experience, no one really stood out as a negative. On the other side of that subject, no one really stood out as that good either. The main weakness that I found in the movie was the dump truck load of political and sociological undertones that were dropped on my head. I get it! America is a violent country with lots of guns and a disregard for the poor. Can we not just move on with story and not try to solve all the problems of the country with a movie? The Purge: Anarchy was not a bad movie. I went in knowing full well that it was a money grab sequel, I was right. If you liked the first one and wondered what else you could do in the story, then you will probably enjoy this installment. If mindless violence for the sake of violence, intense political undertones, and ambiguous morality in your heroes is a turn-off for you, then I would advise you to skip this one. Overall, when it hits Redbox, throw a dollar at it. Don’t purge $10 from your wallet at a theatre on this one.